Richelson filed the FOIA request shortly after CIA director John Brennan’s March 2015 announcement that the agency would undergo an extensive restructuring intended to eliminate “seams” in coverage (as a result of the reorganization, the NCS is now named the Directorate of Operations). Previous charts of the NCS had been heavily redacted, and this is the first look at what the actual NCS structure looked like before the March 2015 reorganization. 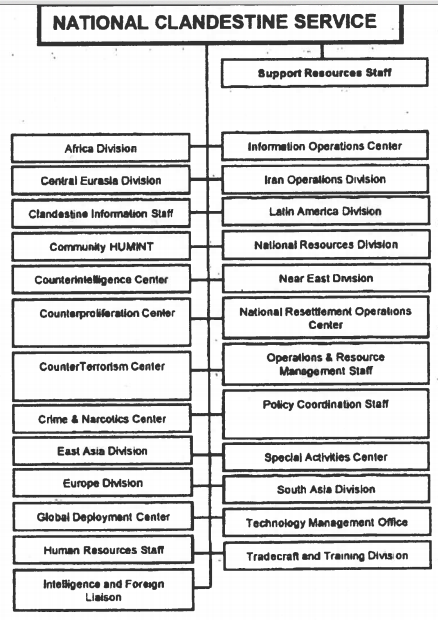 The FOIA release shows that the NCS offices listed alphabetically are the: Africa Division; Central Eurasia Division; Clandestine Information Staff; Community HUMINT; Counterintelligence Center; Counterproliferation Center; Counterterrorism Center; Crime and Narcotics Center; East Asia Division; Global Development Center; Human Resources Staff; Intelligence and Foreign Liaison; Information Operations Center; Iran Operations Center; Latin America Division; National Resources Division; Near East Division; National Resettlement Operations Center; Operations and Resources Management Staff; Policy Coordination Staff; Special Activities Center; South Asia Division; Technology Management Office; Tradecraft and Training Division. On the left a CIA org chart from 2009, and on the right the CIA’s org chart released to the Archive in 2015. Brennan noted in his March reorganization announcement that, “The overhaul is designed to foster deeper collaboration and an intensified focus on a range of security issues and threats, replacing long-standing divisions that cover the Middle East, Africa and other regions with hybrid ‘mission centers’ modeled on the CIA’s Counterterrorism Center” (the CTC is the unit that ballooned after the 9/11 attacks and “became a paramilitary entity with its own fleet of armed drones”). The reorganization, which went live earlier this month, creates 10 new centers that agency officials liken to the Pentagon’s establishment of operation centers like CENTCOM and AFRICOM. Six of the CIA’s new centers have a regional focus – Africa, East Asia and Pacific, Europe and Eurasia, the Near East, South and Central Asia, and the Western Hemisphere – and four have a mission focus — counterintelligence, counterterrorism, global issues, and weapons and counterproliferation.